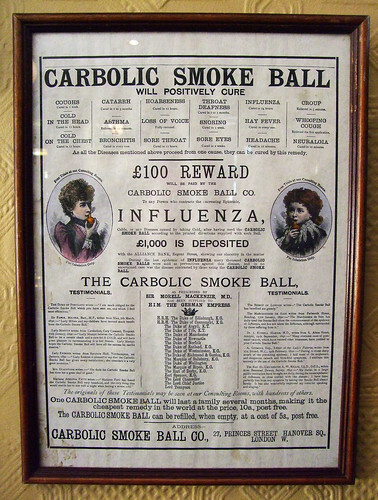 Any law student, past or present will remember Carlill v Carbolic Smoke Ball. The first step in any contract is to identify an offer, and law students will start with the general principle that adverts are usually seen as invitations to treat (Partridge v Crittenden). There is a logical reason to this as explained by Lord Herschell in Grainger & Son v Gough. To see the advertisement as an offer would mean ‘a merchant may find himself involved in any number of contractual obligations to supply [goods] of a particular description which he would be quite unable to carry out’. So there is a logical and practical reason to apply the general rule: The focus being on the bi-lateral agreements. So what was different in Carlill? Many students will tell me that there can be unilateral offers, ones made to the whole world and the reason Carlill was different was that the Company had paid £1000 into a bank. But this is too simplistic. At the time of the advert it was not unusual for companies to make exaggerated claims, one tablet was claimed to prevent divorce! So such claims may just be seen by the Company as another such ‘puff’. Lindley LJ focussed on the wording of the advertisement, pointing out the requirement of an offer is the clarity of the words (see Scammel v Ousten on this point). The test for making an offer is an objective one ( see Smith v Hughes) and Lindley LJ asked not what the Company meant by the words of the advertisement but what the reasonable person would believe from the advertisement. He referred to the words ‘…£1000 is deposited with the Alliance Bank, Regent St, shewing [SIC] our sincerity in the matter.’ So the deposit of the money was to show, objectively that they intended the words to be taken seriously. Not to be confused with a general intention to enter into legal relations but an intention to make an offer. imprecise to amount to an offer and was ‘mere puff’. Bowen LJ rejected this as being ‘mere puff’ but that the words were sufficiently clear to maintain an offer. He felt that if a person chose to make an extravagant offer that was their choice. This reflects one of the main principles of contract law, the freedom of contract and to contract on the terms which you choose. 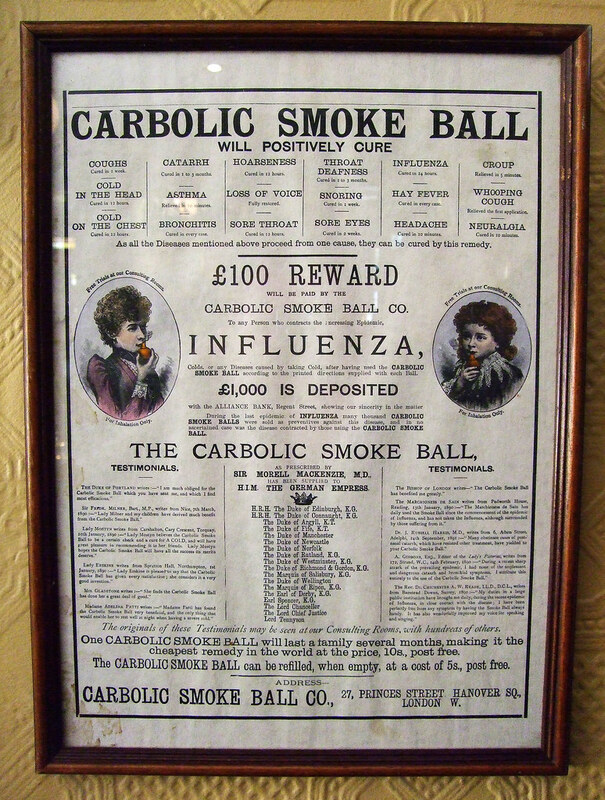 The advert stated that any person had to buy the smoke ball, use it as prescribed and catch the flu. If they did so then they would get £100. Lindley LJ pointed out that full acceptance was in satisfying all three elements. The problems of considering an advertisement as an offer identified by Lord Herschell in Grainger & Son v Gough were overcome, as full acceptance required an offeree to obtain a ball first. If the stock had run out they could not accept. So the policy against adverts being offers was overcome, therefore the basic requirements of clarity prevailed. revoked the offer then there is a binding contract. The next argument of the Company was that there was no consideration. Smith LJ pointed out that the argument that there was no consideration between the Company and Mrs Carlill could not run. The purchase of the ball, and use correctly, then catching the flu was the consideration by one and the increased sales were consideration constituted the necessary benefit to create a promise to pay. reminded me of the fundamental in contract and how a good legal argument can be presented. acceptance, which was also rejected. Then that there was no consideration, again rejected. Sometimes students are too busy to read cases in original but it may enhance their ability to formulate a legal argument, present authority and argue to a conclusion if they try to read at least two or three. It can be seen from reading this case, for example, that in the cases referred to as authority, such as Grainger & Son v Gough, very little of the facts of that case are given, but the principle of the case is applied to the facts before the Court. This is what a student is required to do when answering an exam question. So reading cases has two benefits; students learn a legal principle and learn how to present a legal argument logically and with authority. Previous Post: Towards a Written Constitution? Would the situation have been different if the company had revoked the offer a little before Mrs Carlill made the application for the 100 pounds? I am looking at a situation where Mrs Carlill had done everything else save for applying for the 100 pounds. My view is that within a reasonable period of time, the company could not withdraw the offer in respect of those smoke balls that had been bought. I think the court would hold such hast withdrawal of the offer to be a fraud whereby customers are enticed into buying the smoke ball, and before the effects of the smoke ball could be felt, the offer is withdrawn! If Mrs C had done all that was required, buy the ball, use the ball and caught the flu then she has complete acceptance. The company could not then revoke the offer as a revocation must be communicated before there is acceptance, Payne v Cave. If, however they had revoked the offer before she caught the flu it could be argued, see GNR v Witham, that as there had not been acceptance it can be revoked. However, it was suggested in Errington v Errington-Woods that if Mrs C was willing and able to continue performance, although I doubt she wanted the flu, she should not be denied the right to complete the required performance. I think as you suggest, it will depend on the timing of the revocation in relation to her performance. In my opinion, the decision of this case was pretty much just as it did lay down just limitations on manufactures and companies. As in today’s world, companies do make fraudulent adverts which probably do make an influence on the customers to buy their products. And because of this case, they are cautious.